As she was exploring her postsecondary options in France, Clémentine Fournier was drawn to chemistry and physics, and she wanted a way to study both. Clémentine learned about Mitacs’ Globalink Research Internship program from her school and knew she had to apply: “I want to pursue a master’s degree at McMaster University, and I knew I had a unique opportunity to understand research in Canada before I started my graduate program.” She applied for and was matched on a project at the University of Saskatchewan, supervised by Dr. Matthew Paige in the Department of Chemistry. I was so happy when I was accepted — I couldn’t wait to work on the project,” she says. Clémentine’s project has her applying her chemistry and physics expertise to testing a membrane intended for water filtration systems. The membrane will be used in remote areas of Canada, like the North, where clean drinking water isn’t always available. 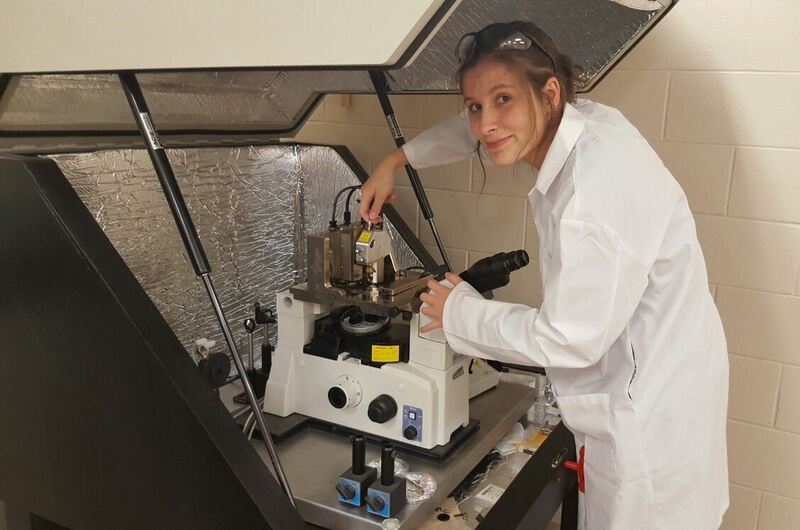 “My work involves applying different ions to the membrane and evaluating the results to refine the membrane’s functions,” Clémentine explains. Mitacs thanks the Government of Canada and the Government of Saskatchewan for their support of the Globalink Research Internship program in this story. Across Canada, the Globalink program also receives support from Alberta Innovates, the Government of British Columbia, the Government of New Brunswick, the Government of Newfoundland and Labrador, the Government of Nova Scotia, the Government of Ontario, the Government of Prince Edward Island, the Government of Quebec, and Research Manitoba. In addition, Mitacs is pleased to work with international partners to support Globalink, including Universities Australia, the China Scholarship Council, Campus France, India’s Ministry of Human Resource Development, Mexico’s Secretariat of Public Education,Monterrey Institute of Technology and Higher Education, and the National Autonomous University of Mexico, Saudi Arabia’s Ministry of Education, and Tunisia’s Ministry of Higher Education and Scientific Research and Mission Universitaire de Tunisie en Amerique du Nord.